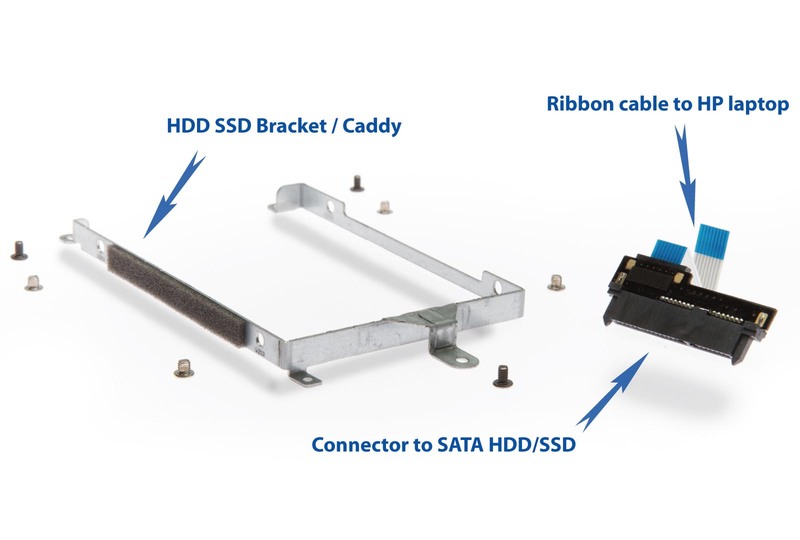 2nd HDD / SSD SATA Ribbon Cable and Caddy Hardware Kit for the HP Envy (17-nxxx) 17-n000, 17t-n000, 17-n100, 17t-n100 and (m7-nxxx) m7-n000, m7-n109dx Envy 17t-rXXX Envy 17t r102nl, 17-r118, 17-n152na series laptops. IMPORTANT! : not compatible with other generation ENVY 17 Series laptops. If you are unsure of what laptop series you have, please check the bottom of your laptop or check underneath the battery (remove the battery to see the series model number). The model number should look something like this "17t-Nxxx" or "17-Nxxx" "17t-Rxxx" or "17-Rxxx"
This "caddy hardware and cable kit" will enable you to add a 2nd hard drive to your Laptop. 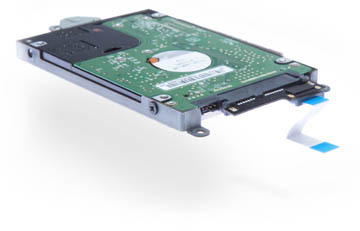 Your Envy 17 Nxxx series laptop comes from the factory with two internal 2.5-inch hard drive bays. 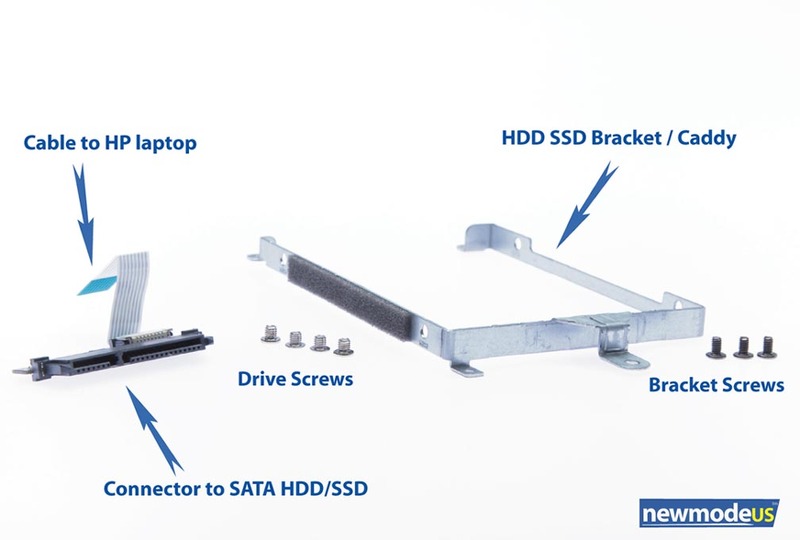 All you need to add a 2nd HDD or SSD is the correct caddy hardware and cable kit. 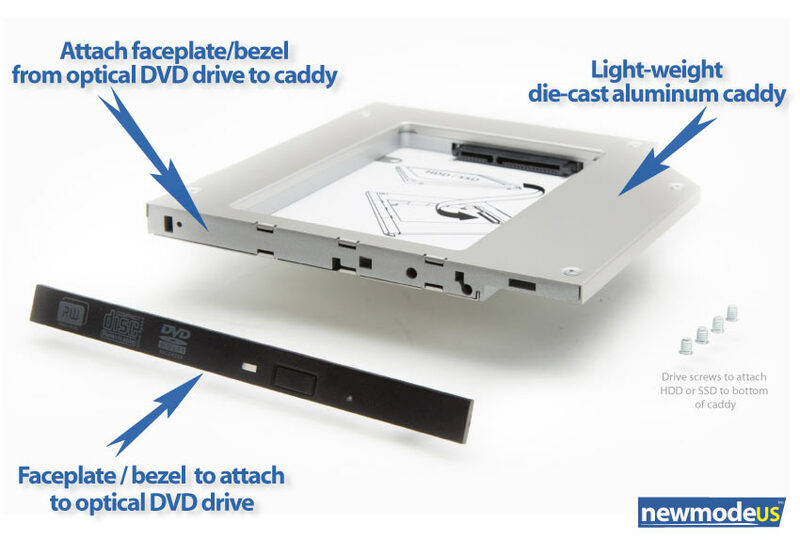 This product includes the caddy/bracket, ribbon cable, four drive screws and three mounting screws as shown in the photo below. 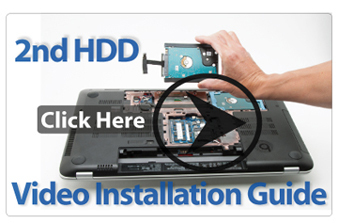 Note: This caddy hardware and cable kit are for HP Envy 17-Nxxx series laptops. If you are unsure of what laptop series you have, please check the bottom of your laptop or check underneath the battery (remove the battery to see the series model number). This is not an HP Original Part. Hard drive and SSD not included. (Disque dur SATA cable pour HP Envy, festplatte kabel, M8W99AV_1).